Ever since the University of California launched its Global Food Initiative in 2016, UC San Diego has made efforts to alleviate food, housing, and financial insecurity for its students. The UCSD Guardian spoke with some of UCSD’s basic needs resource centers to discuss their progress so far and what still needs to be done. If you’re a college student, chances are you’ve experienced food insecurity: a lack of access to food that is both affordable and nourishing. Food insecurity is part of a larger measure of circumstances known as basic needs, which are the minimum necessities for well-being. Food, shelter, access to healthcare, and other means of security are all considered basic needs. In the 2016 UC Global Food Initiative’s Student Food Access and Security Study, students across UC campuses reported that they often encountered barriers to food access. Thirty-nine percent of participants cited cost as a barrier, 48 percent reported lack of time to prepare food, and 46 percent reported lack of time to shop for food. These rates were about 5 percent higher for students who identified as food insecure. But such large numbers of UC students — including food-secure students — who are experiencing barriers to food demonstrates how widespread this issue is. Challenges to sustaining food access and basic needs plague the entire UC system. Yet, in spite of the fact that 44 percent of UC undergraduates and 26 percent of graduate students have experienced food insecurity, it remains a highly stigmatized issue. Students who are privileged with food security may look down on their peers who cannot afford food. In turn, food-insecure students might be too embarrassed to reach out for assistance. Alexis Wesley, a John Muir College sophomore who serves as outreach manager for the Triton Food Pantry, discussed the stigma surrounding food insecurity. “There might be people who are embarrassed to visit the pantry or other resources on campus,” she said. “We need to identify that this is a widespread problem and no one should be ashamed to look for help.”. UCSD’s 2016 Basic Needs Report provides a sense of what food insecurity looks like at UCSD specifically. One barrier to fulfilling basic needs is the discrepancy between the estimated cost of attending UCSD and the actual cost of living in La Jolla, which is 79 percent higher than the national average. Another barrier to basic needs that is prevalent at UCSD is the challenge of transportation and parking. Because the campus has limited parking and is situated away from other areas of San Diego, students often have trouble getting to and from campus and thus have limited options for the food and health care resources they can utilize. Student populations that are especially vulnerable to food and housing insecurity, according to the Basic Needs Report, include members of lower income brackets, first-generation college students, and first-generation immigrants. Members of the LGBTQ community also represent an at-risk population, as their families may not support their identities and, by extension, be unwilling to provide for them financially. What may be surprising to some is that middle-class students are at risk for lack of food and housing. These students can come from families with income levels that are too high to qualify for financial aid but too low to cover the cost of attendance for college. 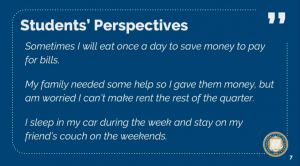 Wesley talked about which populations of students are using the pantry’s services more often. “You’d think upperclassmen would be more food insecure because they tend to live off campus and don’t have dining plans, but we are finding from our data that a lot of lowerclassmen are still visiting the pantry,” she said. On Jan. 15, the UC Board of Regents met with the university system’s Special Committee on Basic Needs at UC San Francisco. The committee discussed the progress it has made since UC President Janet Napolitano launched the Global Food Initiative in 2016. The initiative seeks to develop solutions for food, health, and sustainability throughout the UC system and beyond. “There’s no other system in the country that is doing this. There’s no other system in the country that has believed in students’ basic needs the way that [the University of California] has,” said Chair of the Basic Needs Committee Ruben Canedo said before continuing on to the committee’s model for preventing food, housing, and financial insecurity. Part of what was discussed at the UC Regents meeting was how, in comparison to other UC campuses, UCSD is at the forefront of implementing resources for students who are in need. 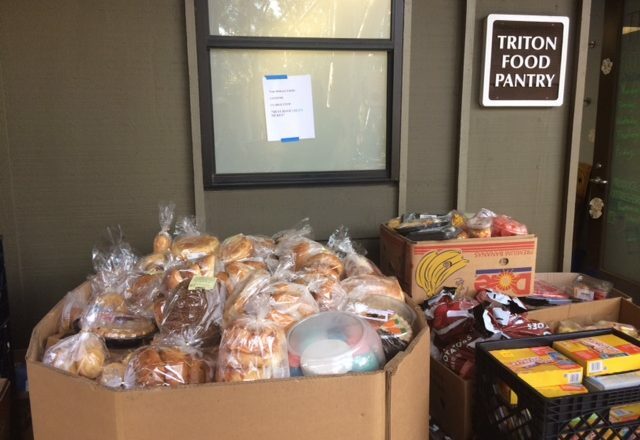 The Triton Food Pantry is one service that the university has implemented to help fight food insecurity. Located in the Old Student Center, the pantry is open to all undergraduate and graduate students. Visitors to the pantry can grab free food items, including canned goods and fresh produce, based on a point system that regulates how many items students are allowed and how often they can come into the pantry. Next door to the Triton Food Pantry is The Hub, another holistic resource for students experiencing food or housing insecurity. In addition to providing free recovered food and a comfortable study space for students, The Hub assists with emergency financial aid and emergency housing programs for students in need. 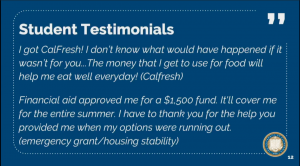 Another important facet of The Hub’s mission is guiding students through the application process for CalFresh, a program that provides funds toward buying food. Both the Triton Food Pantry and The Hub were established in the last four years. Changes at UCSD are far from over, however; this year, the Basic Needs Committee is focusing on expanding housing support and CalFresh access. Though the university has made terrific progress in the past few years toward securing basic needs, there remains much to be done across the UC system. At UCSD in particular, issues such as parking limitations and insufficient on-campus housing have been left unaddressed. Although the university is currently constructing new on-campus residences for undergraduates, graduate students are faced with the eventual conversion of two on-campus graduate residences into undergraduate housing. This means fewer low-cost, convenient living options for graduate students in the near future. It takes months and months of collaboration and strategizing to form solutions to problems like these. For now, the university is on the path to eliminating basic needs insecurity, one step at a time. With a weary, yet contented smile, Magallanes explained, “It takes a village, it takes a village. If you don’t have lots of people in your village who care and are committed, it’s super hard. [For] everyone who’s in our village, we are really grateful and mindful to respect energy and respect that this takes a lot of people’s time on top of everything that’s happening already. Photo courtesy of Alexis Wesley. Slides courtesy of Alicia Magallanes and Hayley Weddle.